Molaei, M., Abshenas, J., Derakhshanfar, A., Babaei, H. (2006). Use of Conjunctival Grafts and Temporary Tube Implants for Treatment of Teat Sinus Mucosal Injuries. Iranian Journal of Veterinary Surgery, 01(1), 50-57. Mohammad Mehdi Molaei; Jalil Abshenas; Amin Derakhshanfar; Homayoon Babaei. "Use of Conjunctival Grafts and Temporary Tube Implants for Treatment of Teat Sinus Mucosal Injuries". 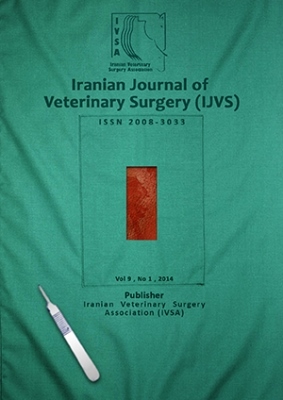 Iranian Journal of Veterinary Surgery, 01, 1, 2006, 50-57. Molaei, M., Abshenas, J., Derakhshanfar, A., Babaei, H. (2006). 'Use of Conjunctival Grafts and Temporary Tube Implants for Treatment of Teat Sinus Mucosal Injuries', Iranian Journal of Veterinary Surgery, 01(1), pp. 50-57. Molaei, M., Abshenas, J., Derakhshanfar, A., Babaei, H. Use of Conjunctival Grafts and Temporary Tube Implants for Treatment of Teat Sinus Mucosal Injuries. Iranian Journal of Veterinary Surgery, 2006; 01(1): 50-57. 1Department of Clinical Science, Faculty of Veterinary Medicine, Shahid Bahonar University of Kerman, Kerman, Iran. 2Department of Pathobiology,Faculty of Veterinary Medicine, Shahid Bahonar University of Kerman, Kerman, Iran. Objectives- Using conjunctival graft to replace experimental mucosal defects of teatsinus.Study- Experimental study.Animals- Five healthy, mature, lactating, Jersey cows.Methods- Conjunct ival mucosal gra fts with teat cannula were evaluated in the repair of experimentalteat sinusmucosal lesions. A 1.5xl em wide circumferential strip of mucosa was resected from each teat in five Jersey cows. Each lesion was then treated by one of the three methods: 1. teatcannula (C ); 2. Conjunctivalmucosal graft and teat cannula (C+G); 3. Only mucosal graft (G). All teats were evaluated 4 weeks after treatment, for patency and luminal diameter by radiography and ultrasonic examination. The cow s wereeuthanized, and teats were collected for histopathologic study.Results- The histopathologic and radiographi c results showed that the conjunctival tissue of the teat wasincorporated by the teat mucosal tissue. Some acanthosis in conjunctiva was observed , due to the stimulationof the teat cannula.Conclusion and Clinical Relevance- Conjuctival grafts can be used in teat mucosal defect s when othertherapeutic methods fail to keep the integrity of the teat sinus mucosa.